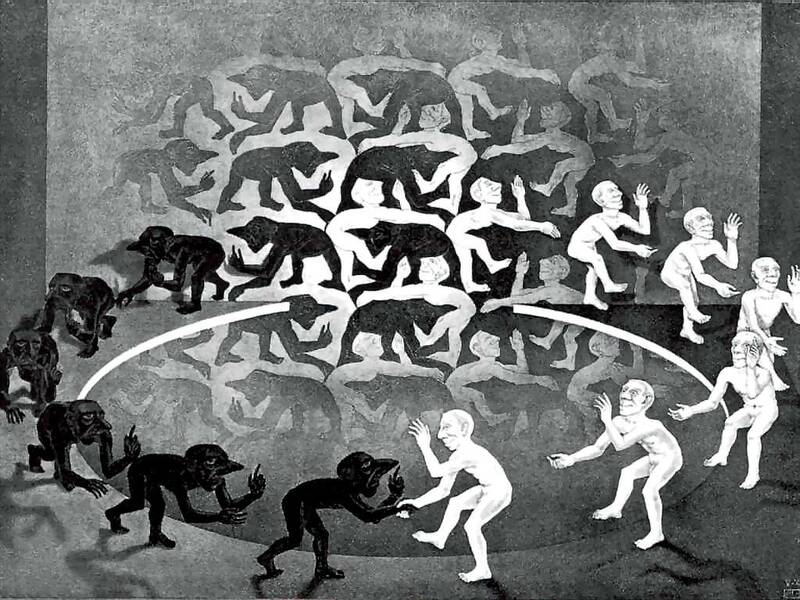 The tessellation of human or almost human forms becomes denser and clearer in the center of the picture, where it finally dissolves: a procession of creatures, half of them white and half of them black, break free from their two dimensional trap and walk to opposite directions, only to be entangled in some sort of metaphysical, cyclical dance. By some invisible source of light hovering centrally above, the creatures’ shadows radiate from the center of the scene, some seemingly still half attached on the tessellation. It is exactly there that the boundary between the two dimensional world of the shadows and the three dimensional world of the dancing creatures becomes vague and undecided. The 2D tessellation becomes thus only a collection of shadows, a fake and poor copy of the real world, an idea strongly reminiscent of the Socratic theory of forms. The two races or species finally reconcile in the foreground by shaking hands in the new, three dimensional world. One may read M.C. Escher’s “Encounter” (1944) in many ways, yet the strongest feature of the engraving is indisputably the illusion of interplay between the 2D and 3D worlds. Maurits Cornelis Escher (1898 – 1972), a master of illusions, repeatedly toyed with transgressions between the two worlds. In “Reptiles” (1943) for example, a tessellated lizard makes an ephemeral, vain journey into the 3D world only to humbly return to the 2D trap of a drawing. In “Cycle” (1938), a human figure rushes from a three dimensional, geometric building into an abstract sea of 2D, tessellated forms. And in “Magic Mirror” (1946), a mirror assists tessellated griffins to stand upright from a drawing and be freed into the 3D world only to fall back again into their 2D trap by the inverse process. Creating a realistic picture is indeed largely about transgressing from the 3D world we perceive towards the 2D world of the painting surface by setting up a convincing illusion, a deception such as those Escher commented upon. Painting is a path from the 3D world towards a 2D surface, subject to specific rules imposed by the way we perceive or, in more technical terms, the way the human eye works. The associated techniques of linear perspective, initiated in the 15th century by Leon Battista Alberti (1404 – 1472) and later developed into an elaborate system, are purely mathematical, connecting the fundamentals of painting to the fundamentals of Geometry and Mathematics. In the core of the theory is the convention of selecting an arbitrary, unique point in 3D space and refer solely to the light rays reflected from the 3D subject towards this specific viewpoint. The 2D image is formed by the intersections of these converging light rays with a theoretical picture plane, representing the painting surface. As a consequence, any set of parallel lines intersecting the painting surface should be rendered as lines converging to a “point at infinity” or vanishing point, away from the viewer. Until Renaissance, much of the artistic pictures produced displayed various, unsystematic features intended to create the illusion of depth, such as the arbitrary reduction of the relative sizes with distance, often resulting in inconsistencies. After 15th century and the development of the theory of linear perspective, painting shifted towards meticulous, geometric constructions and artistic skill became equally important to the geometrically accurate depiction of buildings and pavements. 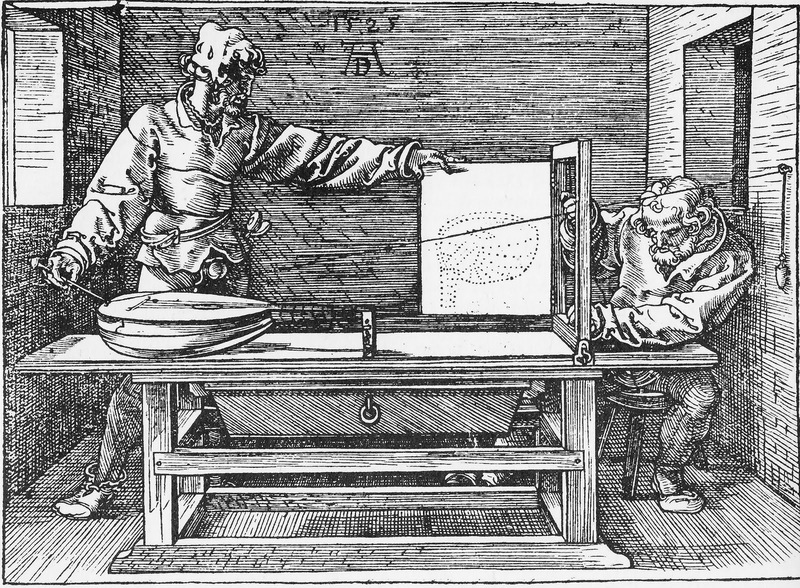 In some cases the pursuit of geometric accuracy led to the invention and employment of camera lucida type devices, such as the one appearing in Albrecht Durer’s “Underweysung der Messung”. Considerations about the rules of linear perspective seemed not imperative for Christian iconography: as icons were meant for worshipping purposes, their spiritual character was far more important than petty technicalities about perspective and the iconographer was more a communicator with God than an illusionist. Exercising a form of art closely related to the divine and the metaphysical, Christian iconographers naturally departed from realism and sought refuge in abstraction, a tendency that evolved slowly after the second century A.D., employing standardized compositions, a symbolic alphabet of poses, gestures, colors and even purely abstract, geometric forms. Holy beings, such as Jesus, Mary or the Saints, are represented as non realistic, almost non material human figures clad in brightly colored garments with elaborate folds. Proportions and relative sizes are often inaccurately rendered: infants are shown as downscaled copies of adults and even the reduction of sizes as distance is increased, is loosely employed often with obvious inconsistencies. This abstract alphabet went so far as to question the basic concept of linear perspective theory, namely the convergence to points at infinity and, albeit unsystematically, follow a path with the reversed rule, having parallel lines converge towards the viewer instead away from the viewer. Finally, the heads of holy beings appear self – luminous, enclosed in supernatural, usually circular haloes, rendered either as bright rings or golden disks. Haloes evolved after the 4th century A.D., modeled upon Hellenistic and Roman versions of emanating light rays observed today on surviving depictions of Apollo and Poseidon which in turn may have been influenced by Zoroastrian prototypes. Concerning their geometric nature, one could assume that haloes are supposed as spheres of light, naturally appearing circular from any point of view. An example is provided by the mosaic of the “Koimesis” (Dormition of the Virgin) in the Byzantine Church of the Holy Savior (Chora Church) where haloes are employed to distinguish holy beings. The haloes appear as circular disks even for faces appearing in profile or three quarters suggesting that they might be supposed as spheres of light. Jesus’ figure, holding an infant as a symbol of Virgin Mary’s soul, is surrounded by an aureola of different geometric nature, appearing in two dimensions as a vesica piscis (mandorla), a shape resulting from the intersection of two equal circles, each passing through the center of the other. In a remarkable effect, Jesus’ vesica piscis is depicted as semi – transparent, permitting other figures to be visible, though colored in bluish hues, behind Jesus’ figure. Translated to the three dimensions, this vesica piscis shaped halo could be understood as a spherical surface of revolution, a surface resembling a ball of American football and produced by rotating a circular arc around its chord. Apparently, iconographers using the vesica piscis shaped halo made the reasonable assumption that a roughly spherical shape, such as a human head, should be associated to a similarly spherical halo while an elongated body, such as a human figure, ought to be connected to a similarly elongated halo. There are examples of haloes however that cannot be associated to any sort of miraculous, luminous radiation but rather may be viewed as purely symbolic shapes employed as a means to highlight specific persons and convey a special meaning about their status. Square haloes have been used to signify living persons and distinguish them from deceased, holy persons depicted in the same picture. A striking example is a mosaic from the oratory of Pope John IV in Vatican, dated around late 7th century. Another, more typical example can be found in the 7th century basilica of St. Demetrius in Thessaloniki, Greece where St. Demetrius, with a circular halo, appears amongst bishop Ioannis and Byzantine prefect Leontios, represented with square haloes. An example of a hexagonal halo is provided by Bernardo Daddi’s (ca. 1280 – 1348) triptych of 1338, where this particularly shaped halo is probably used to differentiate a Roman ekatontarch, possibly St. Longinus. Triangular haloes were sometimes used for God the Father, to represent Holy Trinity, such as the halo of Pantokrator, on the dome of the chapel of the Greek Orthodox monastery of Temptation, Jericho. 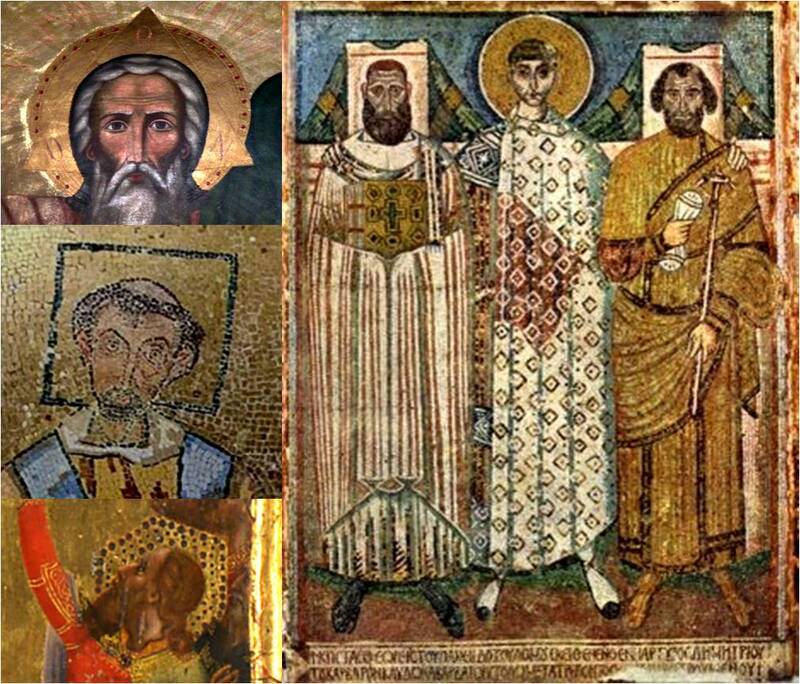 Right: St. Demetrius (with circular halo) amongst bishop Ioannis and prefect Leontios (with square haloes). From the 7th century basilica of St. Demetrius, Thessaloniki, Greece. Upper left: Image of God the Father with a triangular halo superimposed over the ordinary circular halo. The vertices of the triangle accomodate the letters of the phrase “Ο ΩΝ” (the supreme being). From the Greek Orthodox monastery of the Temptation, on the West Bank near Jericho. Middle left: Fragment of a mosaic, dated as older than 707 AD, depicting a square halo. From the oratory of Pope John VII, Vatican. Lower left: A polygonal halo. From Bernardo Daddi’s triptych of Crusifixion (1338). The Geometry of haloes seemed to work fine on a symbolic level as long as Christian art remained restricted within the two dimensional boundaries of the more than a millennium long tradition of iconography. Yet, with Renaissance, like in Escher’s “Encounter”, human figures seemed to be detached from their 2D trap and acquire volume and plasticity as the rules of linear perspective came into play. As the tradition of the haloes was still alive, the developing, plastic compositions demanded for some sort of resolution on the halo problem: what exactly is a halo after all and how could it be rendered in the new framework? The halo became thus a widely depicted, so far purely two dimensional object that time had come to be detached from the plane and acquire a third dimension before its image, processed using the laws of the new, geometric art, returns to the two dimensional painting surface. The story of the halo inevitably brings to mind the cyclical dance of Escher’s forms, in and out of the plane, only now the object travelling back and forth between the 2D and 3D worlds, the halo, is purely imaginary with no model in the real world for someone to rely upon and its exact three dimensional shape has therefore to be invented. In a way, the half – attached on the plane creatures of “Encounter” seem to capture the exact nature of the problem artists had to face at that time. 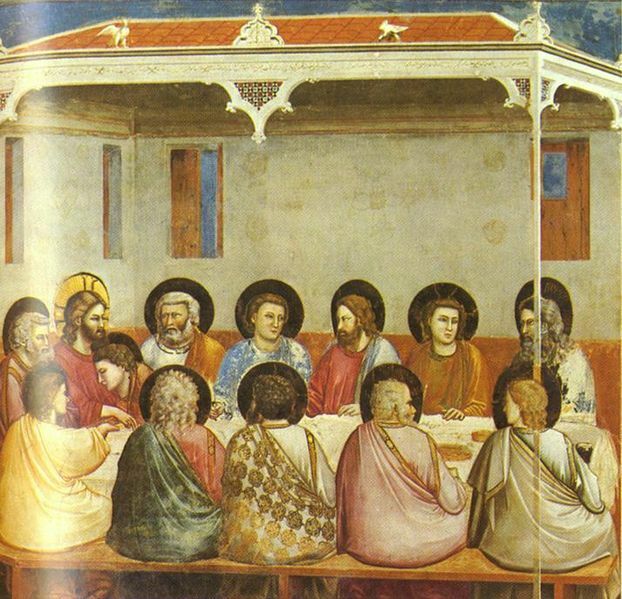 Artists came up with various solutions to the problem, some of them ingenious and elegant while others quite awkward such as the highly naturalistic Giotto’s “Last Supper” from the Cappella Scrovegni in Padua, Italy, where saintly images are adorned with halo – like disks, some of which are positioned in front and some on the back of the faces, depending on the exact positioning of the figures. In other cases, as in Massaccio’s oddly shaded “Tribute Money” from the Brancacci chapel in Florence, haloes were depicted as material, metallic disks, carried along by saintly figures, as if glued on the back of their heads. 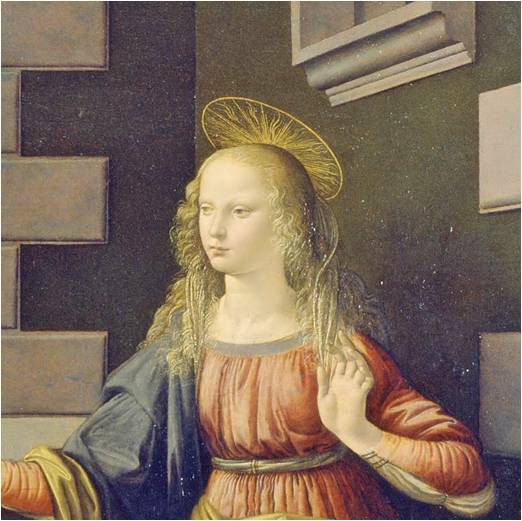 In some other cases, such as in Leonardo’s “Annunciation” (ca 1472 – 1475) the haloes were transformed to light somehow prevented from propagating to all directions and forming a perfect disk hovering above and behind holy heads. 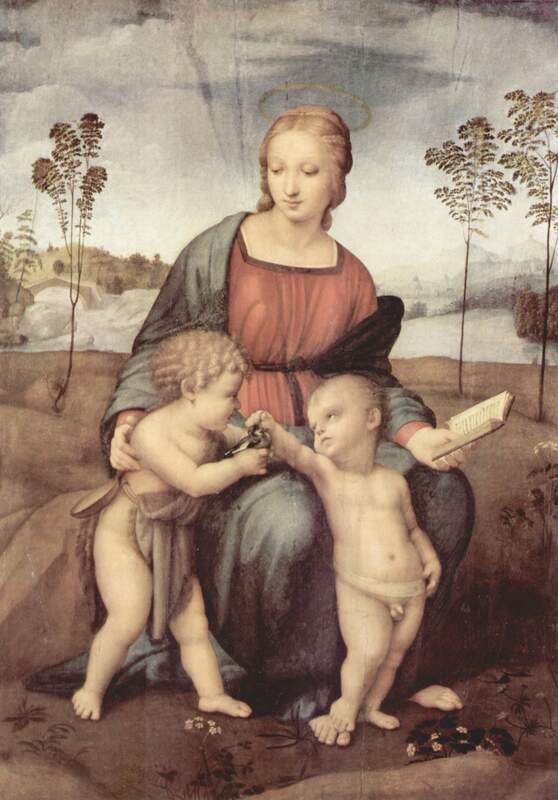 Finally, in numerous cases, such as in Raphael’s “Madonna del cardellino” (Madonna of the goldfinch, ca. 1505 – 1506) haloes acquired the stylized, cartoon – like form of a bright, hovering ring, an image which we are now quite accustomed to. It is quite remarkable that all these solutions of the halo problem never really detached the halo from the plane, treating it always as a two dimensional object and justifying its previous circular appearances in iconography simply as specific, head – on views. In these depictions, the halo never seemed to rise to the status of a sphere. Giotto’s “Last Supper” (1304 – 1305) from the Cappella Scrovegni (Arena chapel), Padua, Italy. The positioning of the haloes creates the impression of screening the disciples in the foreground. 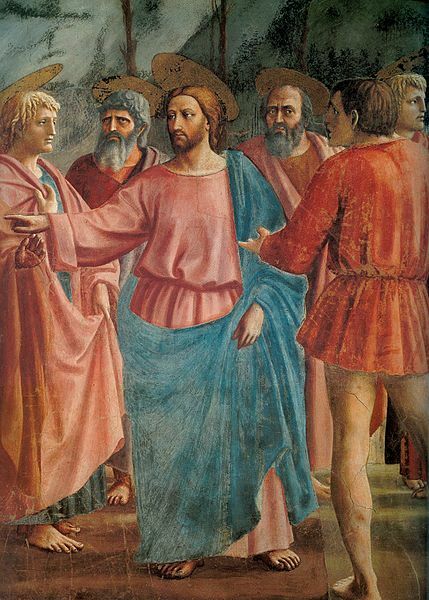 A detail of Massaccio’s “Tribute Money” (completed by Masolino, 1420s), from the Brancacci chapel, basilica of Santa Maria del Carmine, Florence, Italy. Haloes appear as bright, metallic disks attached on the back of the heads of the holy figures. A detail of Leonardo’s “Annunciation” (ca. 1472 – 1475). Haloes appear as a disk formed of light rays. Raphael, “Madonna del cardellino”, ca. 1505 – 1506. Haloes are stylized, bright rings. M.C. 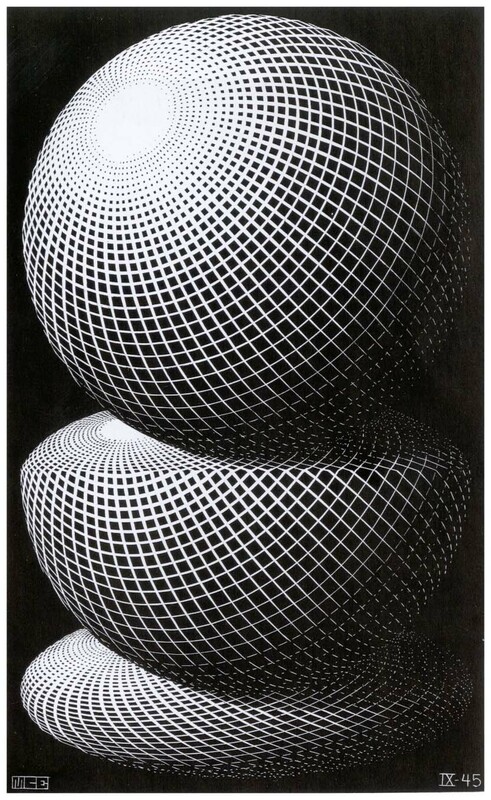 Escher, “Three Spheres” (1945). The work bluntly points out the deceptive nature of artistic 2D copies of the real, 3D world. With Renaissance, art shifted towards geometric constructions in an effort to convincingly transfer the 3D world onto the 2D surface. Ironically, one of the first problems artists were called to address was the exactly inverse problem of transferring a 2D object from the plane into the 3D world, a problem unsolvable in principle, as 2D images are inherently ambiguous. This ambiguity is directly addressed in another of Escher’s engravings, a work named “Three Spheres” (1945) though it is quite obvious that Escher meant to point out a deception: his top “sphere” may be nothing more than a simple circle deceptively designed to look like a sphere. In order to hint to the viewer that this might not be really a sphere, Escher folds in half his supposed sphere and places it in the middle of the picture, as it could be done with a paper disk. Yet still the deception is not eliminated and the resulting shape looks now like a hemisphere. Only the laying flat down of the disk, rendered in the lower part of the engraving, puts a clearer question mark on the nature of the three shapes and reminds the viewer of the inherent ambiguity of 2D renderings and that, after all, a painting is a poor and fake copy of the world. Haloes of Christian iconography evolved in a way that seemed to play the same game of deception with spheres and disks and Renaissance art, from the very beginning, had to face an unsolvable problem. Artists had put too much effort on convincingly transferring the world on a 2D surface yet the halo problem pointed out that this art of deception has specific limits and the meticulously created images may be rendered ambiguous and undecided when time comes to detach the deceptive idols from the plane.